A. Philip Randolph taught us that pressuring candidates and presidents is necessary—for them and for movements. It is good for movements to put pressure on presidential candidates to do the right thing. I did not learn this from a candidate or from a president, of course. I learned this from the man I have always understood as the most steadily radical and steadily successful political actor of the American 20th century: A. Philip Randolph. Those who are uneasy with the pressure that activists are bringing to bear on presidential candidates in the already intense 2016 race would do well to remember the strategies and the successes of Randolph, the labor leader who for the better part of 50 years recognized every campaign and every presidential invitation as an opportunity to demand racial justice and economic equality. When #BlackLivesMatter activists challenge a Bernie Sanders or a Martin O’Malley, when climate-change activists challenge a Hillary Clinton, when campaigners against bloated military budgets challenge all the candidates, they do not merely draw attention to vital issues. They have the potential to make candidates and campaigns — and our politics — better. “Justice is never given; it is exacted and the struggle must be continuous for freedom is never a final fact, but a continuing evolving process to higher and higher levels of human, social, economic, political and religious relationship,” said Randolph, who in his lifetime became an expert at exacting justice, and at evolving candidates and presidents to higher levels of engagement with the civil rights struggle. The candidates and presidents often despised the pressure, and their supporters often decried Randolph for upsetting the best-laid plans of contenders and policymakers. But they would eventually thank Randolph — awarding him the Presidential Medal of Freedom among other honors — because they knew he had made them better than they would have been without the pressure. Randolph never held elected office. After a pair of bids for New York state posts in the 1920s on the Socialist Party line, he rejected repeated pleas that he seek congressional seats or join national tickets. Yet, Randolph and the movements he championed shaped executive orders, helped to forge legislation and defined the debate in his times – to such an extent that his influence resonates to this day, 36 years after the great organizer and agitator died at age 90. For Randolph, serious political work involved much more than campaigns and elections. Instead of running for president, he organized campaigns that forced those who would be presidents to change positions and in so doing changing America. As the leader of the Brotherhood of Sleeping Car Porters, a pioneering union of African-American railroad workers, Randolph was the nation’s most prominent African-American labor leader from the 1930s to the 1960s. He used his stature and his connections to arrange meetings with presidents, and with candidates for the presidency. If the meetings did not bring the progress for civil rights that he sought, Randolph brought the pressure of mass movements to the gates of their conventions, to the grounds of their campaign rallies, and to the White House itself. Frustrated by the failure of the great liberal President Franklin Roosevelt to move to end segregation and discrimination, Randolph in 1940 began with a cadre of young activists to organize the March on Washington Movement that threatened to bring 100,000 African-American activists to the Capitol if FDR did not act. Roosevelt sought to charm Randolph in meetings with the labor leader. Randolph was respectful in his discussions with the president, but he did not bend. He and his allies kept the pressure up and, on June 25, 1941, FDR issued the sweeping Executive Order 8802, which banned discrimination in the defense industries that were gearing up for World War II. After that initial federal action to promote equal opportunity and prohibit employment discrimination, the movement kept the pressure on with mass rallies and organizing to end discrimination in the military, in war industries, in government agencies, and in labor unions — frequently forcing the hand of Roosevelt and his administration. To that end, he declared that, “We will have to continue demonstrations.” And he meant it. He and his allies dispatched a young Michael Harrington to organize protests at the Democratic National Convention of 1960, and those protests forced the party to finally begin to distance itself from its southern segregationist wing. In 1963, Randolph called for a “March on Washington for Jobs and Freedom” in order to pressure then-President John F. Kennedy to get serious about passing civil rights and voting-rights legislation – and about using the power of the federal government to protect civil rights activists from state violence in the south. Randolph never let up, he kept pressing for more racial justice, more economic justice, more justice. Randolph and the movements with which he worked forced candidates and presidents with whom the labor leader had good relations, and who he often believed to be well-intentioned, to move beyond relationships and intentions to action. In so doing, he made the leaders of the United States better than they imagined they could be at responding to issues of racial disparity and economic injustice. There is some dispute about whether FDR actually encouraged the union leader to create pressure that could not be denied, with the line: “Go out and make me do it.” But there is no disputing that Randolph and the movements with which he worked made FDR and Truman and Eisenhower and Kennedy and Johnson do it, and in so doing played a critical role in changing America. Nor is there any question that FDR and Truman and Eisenhower and Kennedy and Johnson are better remembered today because they responded to the pressure. The same goes for the 2016 presidential candidates who are now being pressured. Folks can debate about strategies and tactics, just as they did in Randolph’s day, just as they did when ACT UP activists interrupted “Al Gore for President” events to focus attention on the failure of American policymakers to respond to the crisis of AIDS in Africa. 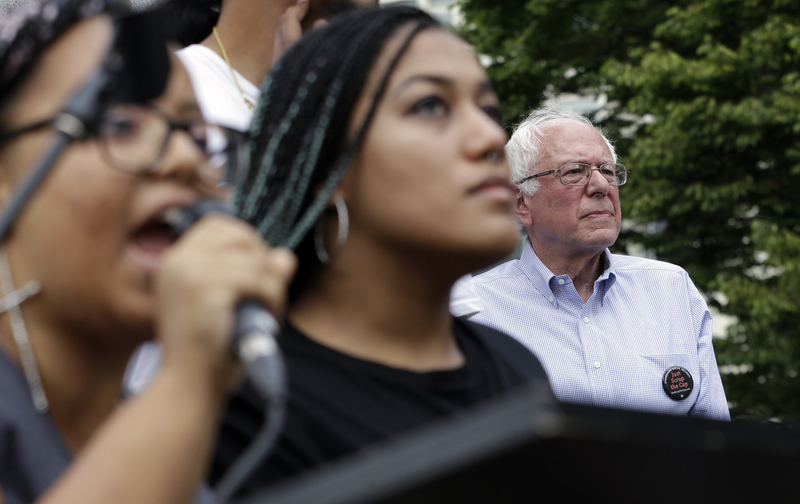 This summer, #BlackLivesMatter activists have interrupted events and challenged both Bernie Sanders and Martin O’Malley to address issues of policing and racism that they argue must be a focus of the 2016 race. Sanders, who was in the crowd when Randolph and King addressed the 1963 March on Washington, has as a senator spoken up about police violence and the neglect of urban communities and unemployed youth. This history, distant and recent, has led some Sanders supporters to gripe that he has been unfairly targeted for pressure. But this misses the point that his campaign has been made sharper and more focused by the pressure it has felt — and the pressure it will continue to feel. The same goes for O’Malley. And so it should be for Hillary Clinton and others. Politics, real politics as opposed to the game show that most of the media perpetuates, involves pressure and it is the response to that pressure that gives us the measure of candidates. No contender for the presidency has ever ended a campaign as he or she began. Campaigns are, and should be, critical pivot points in what A. Philip Randolph understood as the “continuing evolving process to higher and higher levels of human, social, economic, political and religious relationship.” To think otherwise is to accept a politics as usual that reinforces a status quo that needs, on so many issues, and on so many levels, to be shattered.